I was looking for the obituary of William Bullock Clark (1860-1917), a geology professor at Johns Hopkins University in Baltimore, Maryland. Looking in GenealogyBank’s Historical Newspaper Archives, I quickly found multiple obituaries for him. For example, there is this obituary from the Sun (Baltimore, Maryland). Great obituary. It includes the basic genealogical facts: his date of birth, death, and information about his immediate family. These are key research facts and clues to follow up on for more information. 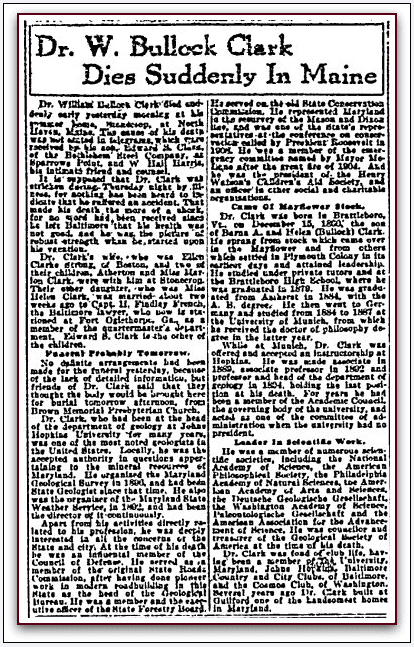 Looking deeper in GenealogyBank’s Historical Documents area, I found this four-page obituary for Clark that is rich in detailed information about his life. Annual report of the Board of Regents of the Smithsonian Institution showing the operations, expenditures, and condition of the institution for the year ending June 30, 1917. Date: Tuesday, January 1, 1918. Publication: Serial Set Vol. No.7432; Report: H.Doc. 1252 pt. 1, pages 663-665. This detailed obituary is a great research find: four pages about his life, his family and his career. It is common for the annual reports of government agencies to include detailed obituaries for not only employees but also for individuals who worked closely with the government – such as Clark, who was a college geology professor who worked with the Smithsonian Institution. Notice that this four-obituary gives us more information on the immediate family and on his colonial ancestors than the shorter obituary in the newspaper did. 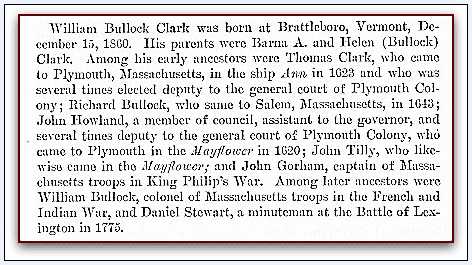 We learn that Clark was a descendant of: John Howland and John Tilly, two of the passengers on the Mayflower; ancestors who fought in the Colonial wars; and Daniel Stewart, who fought at the Battle of Lexington in 1775. This is exactly the type of family history information that we need. Genealogy Tip: When searching in GenealogyBank, don’t search only the newspapers – look at all search results from all areas of GenealogyBank’s resources, including historical documents, government reports and records, the U.S. Congressional Serial Set, historical books, and the Social Security Death Index. 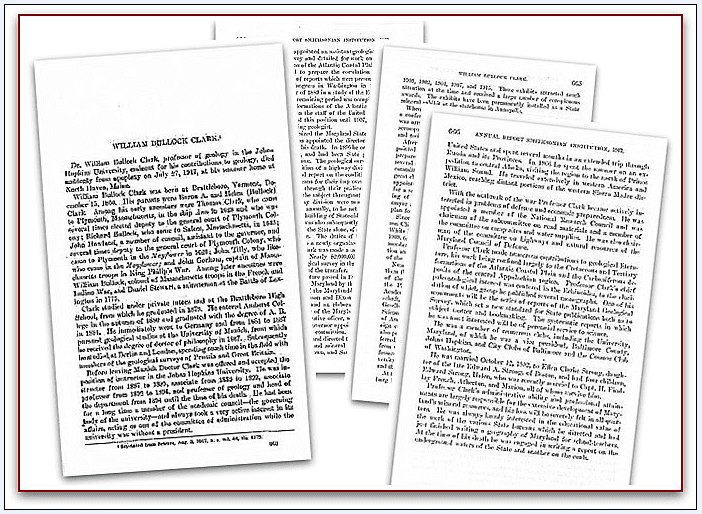 Have you had success finding detailed genealogical records about your ancestors such as this four-page obituary in GenealogyBank’s historical archives? If so, please share your research finds with us in the comments.